Criminals are bad enough as it is, but time criminals… they’re the worst. Not only can they screw up the present, but they can screw up the past AND the future as well. As a member of the Time Repair Agency, it’s your job to travel through time to apprehend these miscreants — these time breakers — and set things right. But be careful. You’re not the only TRA agent on the hunt, and every criminal captured is a feather in that agent’s cap, so don’t be surprised if other TRA agents try to interfere with your efforts. Whether you’re searching the dawn of time or the year 3000, the life of a TRA agent isn’t easy. That’s the concept behind Time Breaker, the newest card game from the inventive crew at Looney Labs, and honestly, I think it’s their best game yet. Time Breaker not only improves upon some of the ideas behind Chrononauts, but incorporates strong elements from the Fluxx games in order to add more choice and more excitement to the game play. The game board consists of 25 tiles arranged randomly in a 5×5 grid pattern. 24 of these tiles represent specific moments in time. The 25th is the Time Repair Agency, and it’s always the center tile. 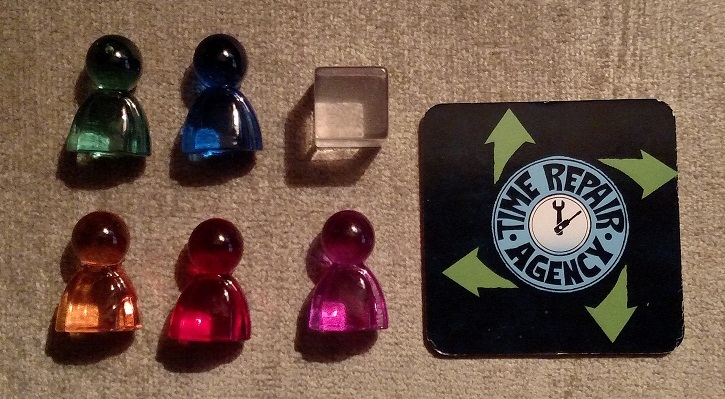 It’s your job to navigate the board, capture the Time Breaker, and return to the Time Repair Agency with your quarry. There are move cards that allow you to move from tile to tile, regardless of where those moments are in time. There are jump cards that allow you to move to a specific tile. And there are action cards that allow you to perform different tasks, including playing extra cards from your hand, or traveling backwards in time. 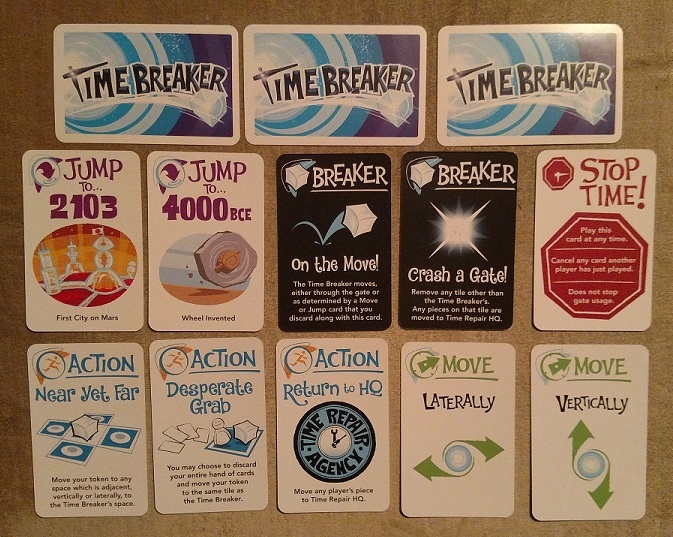 There are also Stop Time cards, which cancel other players’ actions, and Breaker cards that alter the game board or affect how the criminal moves. Since the game is a race to see who reaches the Time Breaker first, it’s clever to allow the players multiple ways to navigate the board. You can move your piece across tiles (like any normal board game), you can jump to certain times with the cards, and you can navigate time itself by moving either backward or forward in time. You see, since each tile is a moment in time, there are two arrows on the tile — one going forward, one going back. Those arrows can help you jump around the board. 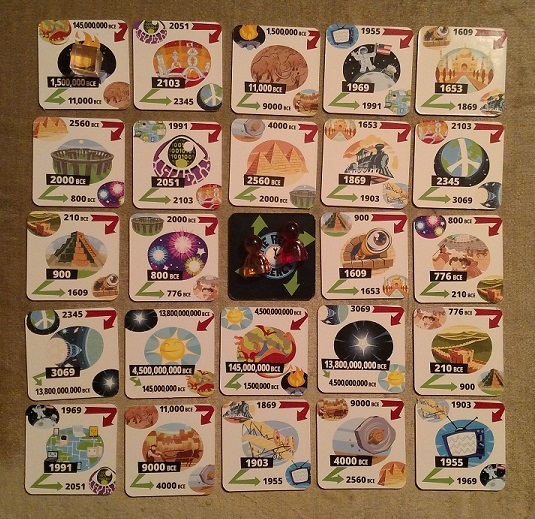 For instance, if you’re on the tile 13,800,000,000 BCE (the start of the universe), following the green arrow forward takes you to 4,500,000,000 BCE (the formation of the sun), which due to the random nature of the game board’s layout, could be anywhere, not just the next tile over. Or you could follow the red arrow backward in time, if you have the proper card for it. (Since we’re talking about the first card in our timeline, it turns out time is cyclical, and going backward takes you to the future, the year 3069 (the colonization of Alpha Centauri). Time Breakers manages to pack a lot of strategy and choice into a small package, ensuring that the game has major replay value. That’s no surprise, of course, since replayability is a hallmark of the Looney Labs brand. But by combining a playing space that’s different every time (similar to Fluxx: The Board Game or Forbidden Island), the randomness of the cards you draw, and the ability to manipulate the board by closing access to certain time tiles, you have a dynamic game that always feels fresh. All those elements could make for an uneven playing experience, but the cards are perfectly balanced, meaning no matter what cards you draw, you’re going to have a fair shot of winning the game. Luck is always a factor, but strong strategy and an ability to adapt on the fly will take you far. And Andrew Looney makes juggling all of these elements look easy. Complimented by a jovial art style, rich in bright colors and whimsy — not to mention a prediction of world peace only a few centuries away! 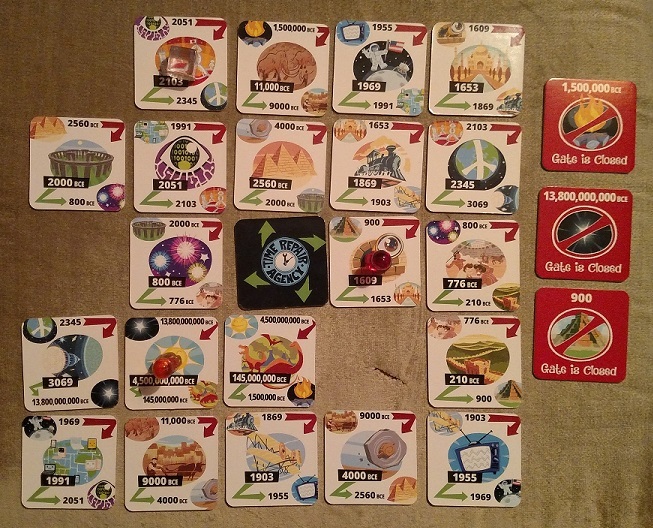 — Time Breaker continues the innovative, enjoyable tradition long established by games like Fluxx, Just Desserts, and Get the MacGuffin. This game is great fun. 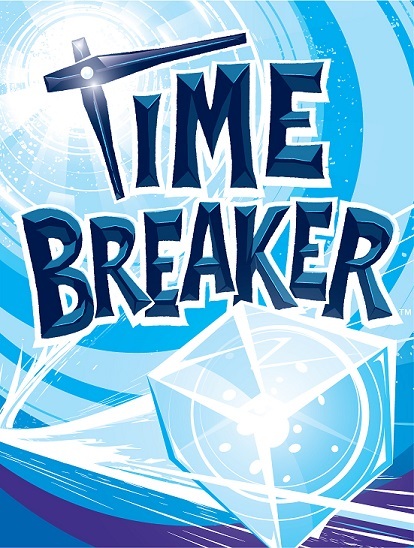 Time Breaker is available from Looney Labs and participating retailers on February 28, but you can preorder it by clicking here! This entry was posted in Games, PuzzleNation, Puzzles and tagged adaptable, card game, chaos, Chrononauts, Fluxx, Fluxx: The Board Game, games, Geeking Out, get the macguffin, Just Desserts, Looney Labs, Pop culture, product review, PuzzleNation, Puzzlin' fool, replayability, replayable, time, Time Breaker, time cop, time travel, timecop by gmdirect. Bookmark the permalink.